Prince William and Catherine, Duchess of Cambridge attended the wedding of Sophie Carter and Robert Snuggs which took place at St. Andrew's Episcopal Church in Norfolk. 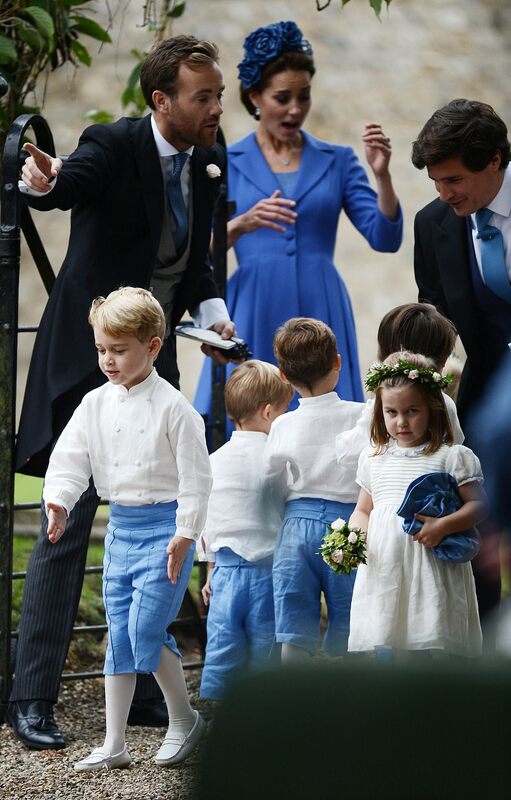 Prince George became the pageboy and Princess Charlotte became the bridesmaid. 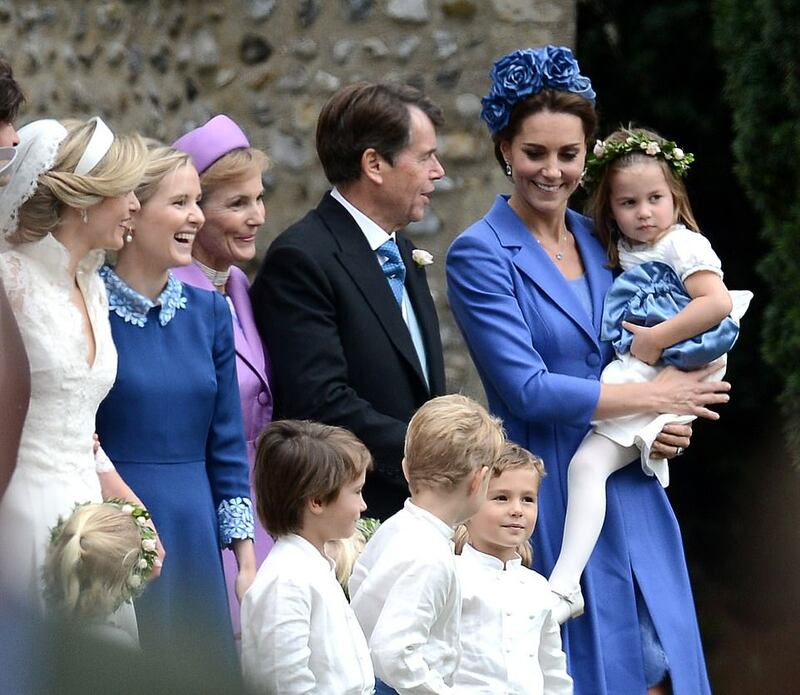 Michael, Carole and James Middleton also attended the wedding. Sophie Carter is one of the close friends of Kate Middleton. At the wedding, the Duchess wore a blue coatdress by Catherine Walker & Co.
Duchess repeat the coatdress nicely by wearing a beautiful head piece and the color is matching the wedding theme . adorable little boys and girls. Congratulations to the newly wed couple. Dss Catherine looks looks lovely today. I am glad she recycles her cloth a different headpiece or shoes and bag and there is a new look.also keeping in with the color scheme. Beautiful bride with a beautiful dress! I think she should try to find her own style. She is too young for those boring coat dresses. hTey are ok for the queen, but she is over 90.
inmho she has a very own and modern style to wear coats. I prefer her style more than Meghans style. I agree with you Anonymous. It is very easy to predict what Kate will wear. Coat dresses are her uniform. I think she is expected to be more conservative due to her position in the family. I think Kate would really like to dress more like Letizia. Before she was a royal, she had a lighter style. Anonymous; she has her very own style, different from anybody else we follow. And I think she is doing mostly very good job with her own conservative style. Catherine has a great fashion sense. This dress coat style/color is so flattering on her. While some may not like the headpiece, it is definitely "English" and I like it on her. I also appreciate how she is careful to wear a previous dress/coat to friends' weddings so as not to outshine the bride. Have missed seeing her on engagements while on maternity leave. Looking forward to October! I really love this blue coat, she looks fantastic with it. I think, she wore it before on her visit to Germany. The shape of this coat is fabulous! George and Charlotte are sooo cute, especially George with this trousers in this fantastic colour. Dress and coat all ways nice and very save. Maybe she like it this way. Her mother wears a lot of the same maybe this help her to choose what she wears.? Catherine's hat has a retro vibe that really ages her; it's reminiscent of those unfortunate floral turbans that the Queen and Queen Mother sometimes wore years ago. Awful. I do love the little boys and their wonderful outfits, though! Duchess looks fabulous. Bride looks beautiful. Children look perfect. That is exactly how little pages should dress for a wedding. Kind of boring to me. This outfit makes her look older than she actually is. But glad to see her and the kids again.